Your Image Here! A completely unique, customized custom portrait or any other image. A personalized made to order dictionary art print that makes a great literary gift. 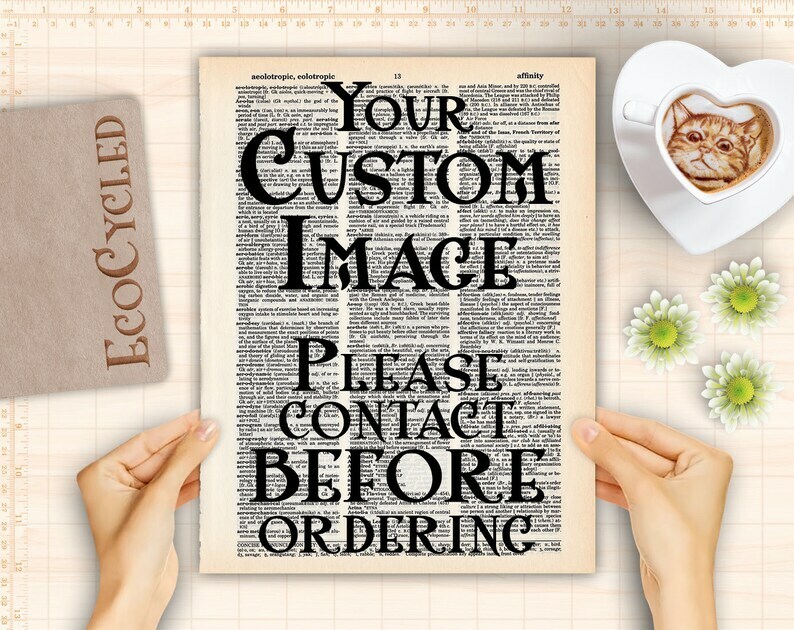 Your imagination is all that limits you on what you can have printed over a lovingly upcycled book art page. We rescue old books and rejuvenate them as clever and unique art just for you. Our book art prints are as smart and unique as you are. **Contact Neece BEFORE you order so we can work together to create the perfect page for you. ** If we can get it or create it, or if you can supply it, we'll work with getting it all on a book page that you will love. (larger images work much better than small ones). TWO Revisions are included with this listing. You can upgrade and have 3 more revisions for $5. Neece will send you the listing to upgrade. You Will Receive: One RANDOM page from the book you choose, with the design shown above. A frame is NOT included and is NOT available (we do not carry them). It will arrive in a clear plastic sleeve to protect it. Each page is unique and might have yellowing, age spots, bent corners, wrinkles, and signs of use which adds to its charm. We print with DURABrite and Claria Epson inks which are fade proof, waterproof, and are archival for over 118 years. So great to work with to make it personal and perfect! Just got it today and already framed it and hung it up! It’s perfect as usual!! I will continue to order from EcoCycled! I love it. It's even better than I imagined and Neece was amazing to work with. She was patient, helpful and worked really hard to get me exactly what I wanted. Fantastic product, wonderful shop, extraordinary owner.